Vasque is back! For over 50 years, Vasque has been outfitting the feet of trail adventurers and explorers in America and around the world. Their boots are legendary while their trail running shoes have had a smaller but still loyal following. After the Mindbender model was discontinued a few years ago, things have seemed fairly quiet on the trail running side for Vasque. The Pendulum model didn’t seem to generate the same level of interest or satisfaction based on many reviews I read. This is all about to change. After two-plus years in development, Vasque just released three new models—the Constant Velocity (8mm drop), Trailbender (6mm drop), and Vertical Velocity (4mm drop). I believe each will be well-received as the three models target specific running styles and terrain. Interestingly, as Bryon Powell pointed out in his round-up from the 2016 Summer Outdoor Retailer show, all three models are an REI exclusive in the U.S. for one year. 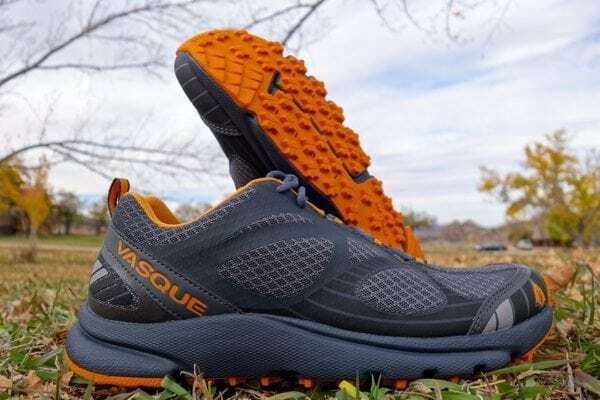 In this review, I will highlight various features of and my experiences with the Vasque Constant Velocity ($120), which weighs in at 8.7 ounces for a women’s size 7 and 11 ounces for a men’s size 9. Without hesitation, I can say that I completely enjoy the Constant Velocity and am having a hard time rotating it out for longevity’s sake. It’s easily comparable with my other favorite ‘most terrain/moderate conditions’ shoes, but even more nimble without sacrificing any protection. Based on 200-plus miles and counting, I’d place the Constant Velocity in the same category as the trusty Montrail Caldorado, the Salomon Speedcross Vario, or the Pearl Izumi M2, but notably with an 8mm drop. Size-wise, I wear the Vasque models in a women’s 9, which is similar to the Montrail and Pearl Izumi brands for me but a half-size larger than Salomon shoes and a half-size smaller than models in La Sportiva’s line. The upper on the Constant Velocity is constructed from an abrasion-resistant synthetic Air Mesh with 0.6mm synthetic film overlays, which enhance structure and debris protection. The Air Mesh has a more open weave centrally from the minimally gusseted tongue to the 1.2mm protective toe cap and a tighter weave medially and laterally. The shoes are very breathable in 40 to 90 degrees Fahrenheit and have no difficulty moving moisture out. The mesh sides have taken several direct hits from sharp-edged rocks and thus far show minimal abrasion. While the overlays are very unobtrusive and have created no hotspots at flexion points anywhere on my foot, they don’t provide significant support. As the miles pile up, the upper becomes more supple and flexible. This is great from a comfort perspective, but if there was anything I’d improve upon, it would be to retain the amount of ‘midfoot wrap’ I felt in the first 150 miles. 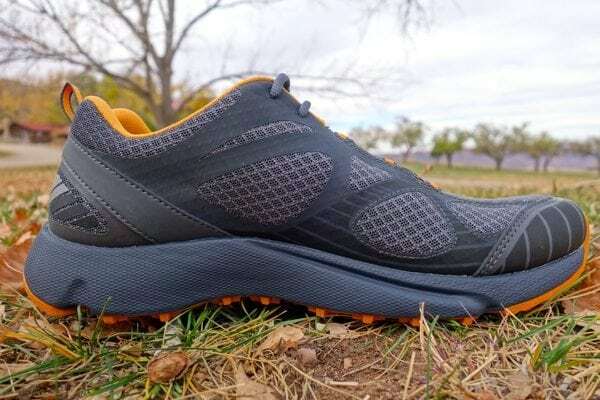 The toebox is classified as “wide and low profile,” but I found it just perfect for my somewhat-wider forefoot with ample room for my toes to rest comfortably without sliding forward into the front end of the shoe on long descents. The heel counter is molded and sufficiently stable without being too rigid and the Comfort Collar is indeed comfortable with no intrusions into the Achilles or medial and lateral ankle bones. The round laces tie easily with thin gloves on and hold double knots well. Lastly, there are reflective hits at the toe and heel to provide a bit of visibility. The Vasque Constant Velocity’s lateral upper. The midsole is constructed of compression-molded EnduraLast EVA, which, coupled with the Anatomical Ortholite X-40 High-Rebound Performance footbed, yields a well-cushioned ride with efficient energy return. The shoe is firm enough to handle multiple 20-plus minute climbs over rocks and hard-packed trail while smoothing the ride down the other side without excessive bounce or bogginess. The Constant Velocity is built on the AR-8 Fit profile, which in my experience allows me as a heel striker to easily find flow and speed down rolling singletrack or jeep roads. The integrated ESS rock plate provides excellent protection without making the shoe feel stiff or heavy. I have yet to earn a plantar bone bruise despite the rocky and rubble-strewn trails I’ve sometimes chosen while wearing these shoes. The outsole of the Constant Velocity features Vasque’s Traction Plus Sole made from their AxisGrip rubber compound, the grip and durability of which is impressive. I have at least 200 miles in this shoe and the sole is just now showing slight signs of wear. If the midsole holds up, the outsoles have several hundred more miles in them despite the amount of rough terrain they’ve been exposed to. The multidirectional lugs consist of patterns of four pentagons placed throughout the outsole and arranged around cut-outs that allow the outsole to conform somewhat to the terrain underfoot. The molded heel crashpad absorbs any impact from a heel strike very naturally while smoothly transitioning through the laterally segmented midfoot to the toe. 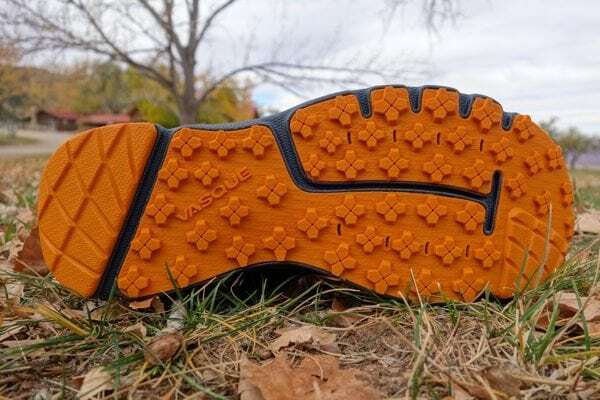 The outsole does really well on our very dusty trails around Colorado and performed perfectly on the rough rocks and sluff in the regional park trails around Phoenix, Arizona. Sand was not an issue in the Arizona washes, and smooth dirt trails were a joy to run as we linked back to the car. This shoe also sticks beautifully to red-rock terrain and the pesky rock slabs found all along the hogbacks in the Front Range. Given that precipitation is all but a forgotten thing in Colorado the past few months, I didn’t get to test this shoe in muck and rain, but based on my experience living in western Oregon in past years, I think the Constant Velocity would work very well until the truly greasy or shoe-sucking mud demanded more aggressive lugs. The Vasque Constant Velocity’s outsole. I think it’s well established that I’m a big softie for an 8-to-10mm drop shoe with ample but not boggy cushion and a thin but still protective rock plate or film. I want to have a good feel for the trail but not get jabbed by it, and I prefer that my feet aren’t the sorest part of my body after a 20- to 50-mile adventure. 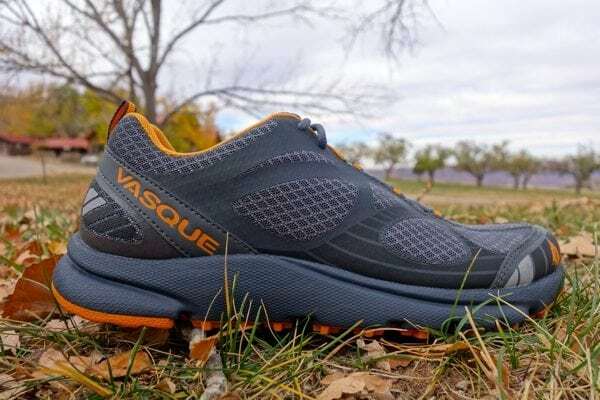 The Vasque Constant Velocity trail shoes deliver. While they don’t have the highly aggressive lugs of my beloved Speedcross to keep me upright on the nastiest mud and snow, I can wear the Constant Velocity in most conditions all day long and still have relatively happy metatarsals. Rim2Rim2Rim in the Grand Canyon, a 50k in Moab, Utah environs, and a jeep road/Continental Divide Trail extravaganza in Colorado’s high country are all easily in this shoe’s repertoire for me. Welcome back, Vasque, and well done! Has anyone else had a sneak peek of or the chance to test the Vasque Constant Velocity? If so, what are your thoughts on these new offerings? 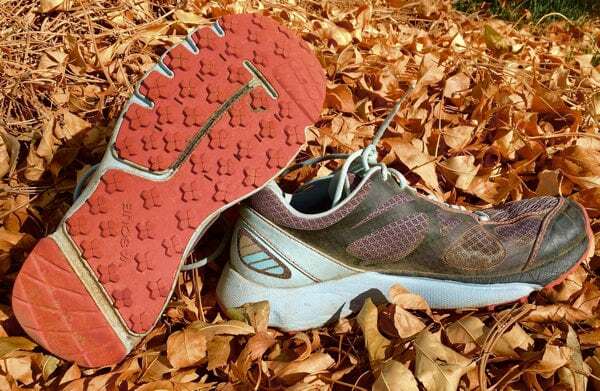 Were you a Vasque trail running shoe fanatic in the past? Which model and what did you love about it? The Vasque Constant Velocity in women’s colors. How do these compare to the Vasque “Mindbender”? I had about 15 pairs of those…..and liked them a lot. We have a review here on iRunFar from a few years back–give it a read. The Mindbender didn’t fit my feet well back then, so I wasn’t able to wear it. From my research, it seems like the new Trailbender (6 mm drop, narrower than Constant Velocity through ball of foot due to overlay placement) and this shoe will be pretty comparable. Hopefully someone from Vasque can add insight. This is Brian from Vasque. I developed the Mindbender as well as the new line of shoes. The biggest difference between the Mindbender and new Constant Velocity will be fit. Before you squirrel away 5 pair of Mindbenders, I would encourage you to try on the new shoes, as the last is an evolution to the original Blur/Mindbender fit. The drop and stacks will be pretty similar, but if you have the opportunity, as Kristin suggested, I would try on the new Trailbender as well. More cushioning, but very stable. The last on all three of the new shoes is exactly the same except for drop. I hope that helps. Outstanding, Brian!! Thanks so much for writing and providing more info. Strong work on the shoes! Thanks Kristin, I appreciate that. Too bad they’re just in REI this year. I’d much rather support specialty run and footwear stores than the big boxes. This is an annoying trend that only seems to be getting worse. I know Hoka has done it and I believe Altra is getting ready to do it with one of their new models. And Brooks has as well. It would be understandable if a shoe company gave exclusive rights to a running store that supported them from the get go, but this is pure marketing on REI’s behalf. REI does a lot of good for the trail world, I don’t know why you would be hesitant to support them. I live in a big metro area and REI is the ONLY store to find more than a single pair of trail running shoes anyway. Red Wing! Any red wing dealership can fit you properly and order vasque shoes, even if they don’t carry them. Have you tried the Nike Wildhorse 3? Really stable shoe, very protective underneath, and a forefoot thats wider than most. I’m loving mine. Sigh. I’m on my last pair of Mindbenders. The uppers have a tear and the lugs on the ball of the foot are almost gone – off to REI. I liked the Blurs and Mindbenders as THEY PROTECTED MY FEET. I do trails with sharp/crushed rocks. Are these comparable protection? This is Brian from Vasque. The Constant Velocity will be similar in protection to the Mindbender. The MB used a thin TPU skin co-molded to the EVA in the forefoot, while the CV uses an ESS rock plate, basically a very firm density of EVA co-molded to the midsole. Trail feel and protection is very similar. The new Enduralast EVA is more compression resistant, letting us mold it a bit lower density for comfort and foot/terrain conformability. I think the protection is excellent and I have tender feet overall. When are these sweet shoes available? The original Vasque Velocity was my favourite trail running shoe here in the UK a few years back. Be great to see them here once again. Hi Kristin , great review. I recently purchased a pair from REI during their Spring Sale for 20% off the retail $120. The discount code was MEMLOVE20 in case anyone is interested in using it. Mine feel great for the short time I have had them and the support is awesome. See you on the trail. super! hope you enjoy them!